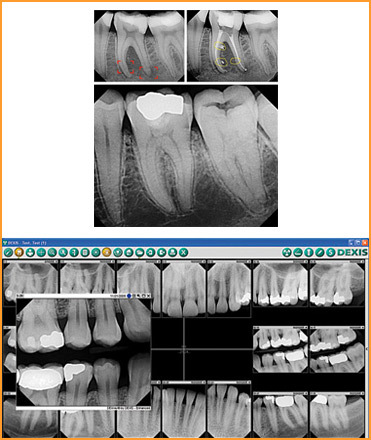 One way the face of dentistry is changing is through the use of digital technology such as digital x-rays and imaging. At Studio B, we use both digital x-rays and imaging on a daily basis to help our patients achieve and maintain happy and healthy smiles. Digital offer many advantages not afforded by traditional x-rays. Digital x-rays decrease exposure to radiation and are more environmentally friendly because they do not require chemicals or film. Digital x-rays also cut down on appointment times because they can be saved to a computer file and viewed immediately on a computer screen. Computer technology allows digital x-rays to be enlarged, enhanced, and measured during the course of an examination. By eliminating the x-ray developing process, digital x-rays allow the doctor to spend more quality time with each patient. Another very important part of cosmetic dentistry today is the use of digital imaging. Digital imaging is a great tool that aids in communication and patient education. By taking digital photographs both inside the patient’s mouth and of the patients smile, the dentist and the patient can now view problem areas together and discuss the best course of treatment. Digital imaging helps patients to make informed decisions about how to best maintain a healthy smile. At Studio B, we use digital imaging not only to detect, diagnose, and discuss oral health issues, but we also use it as a tool to aid in the creation and completion of our beautiful smile makeovers. Throughout the makeover process, we use digital photography to communicate with you and our ceramists in order to insure that you receive the smile of your dreams. We also take lots of before and after photos of the work we do. Viewing before and after photos can help you understand the quality of work we offer as well as the excellent results we strive to provide to our patients. Come experience the difference that digital imaging can make. Please call our office at 480-860-0092 to set up your next appointment.